Now, we have Anthony’s story! Anthony, the eldest of the Bridgertons is now ready to settle down and decided at Miss Edwina Sheffield would do. Of course, he decides this because he knows that he will die the same age as his father and vows not to marry for love. Enter our heroine, Kate Sheffield, the older half-sister of Edwina who is having her first season along with her very beautiful sister. They are currently sharing a season because of tight finances and since she was treated well by her step-mother Mary, and loves Edwina, she is determined that Edwina not fall under the clutches of a rake. Enter Lady Whistledown who mentions Anthony Bridgerton in her column in every issue and Kate has decided that he is a rake of the first order. When she discovers that Anthony has his sights set on marrying Edwina, Kate is determined to thwart his devious plans! And of course, Anthony proves Kate wrong. And of course, Kate and Anthony get caught in a very compromising situation and must marry because – SCANDAL! 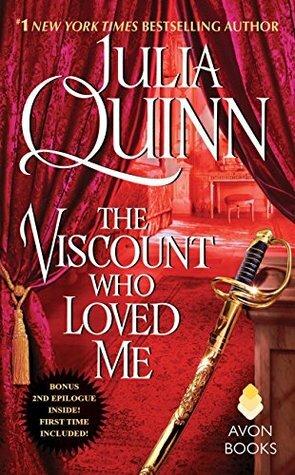 The Viscount Who Loved Me is full of snark and bickering and is a typical hate to love trope. This is one of my favorite tropes and I loved the first part of the book until the dreaded shotgun wedding! This is the same plot as that of The Duke and I and because I read this back to back, I felt it has been too overused. So, after that my enjoyment took a significant dip. I do love Anthony and Kate. I feel like they were a perfect match, their chemistry was also on point and of course, I was laughing out loud every time the two meet! Yes, the banter is epic! One of my favorite scenes is the Pall Mall game and I couldn’t resist laughing out loud that I scared my cat! The BEST part of The Viscount Who Loved Me is the Second Epilogue because we get to see them years in the future where they still re-enact that first Pall Mall game which has become a yearly event where both one-up each other on the field. I was laughing out loud again. This book is also narrated by Rosalyn Landor and even though I am not a fan of the voices that she uses, she didn’t bother me as much. Yes, I still hate her male voices but her female voices aren’t high-pitched and annoying, so that is a plus! I’m curious to know what you think of the shotgun marriage trope? Do you think it has been overused in romances? #1 New York Times bestselling author Julia Quinn loves to dispel the myth that smart women don’t read (or write) romance, and in 2001 she did so in grand style, competing on the game show The Weakest Link and walking away with the $79,000 jackpot. She displayed a decided lack of knowledge about baseball, country music, and plush toys, but she is proud to say that she aced all things British and literary, answered all of her history and geography questions correctly, and knew that there was a Da Vinci long before there was a code. In 2010, Ms. Quinn won her third RITA Award in four years and was the thirteenth author to be inducted into the Romance Writers of America Hall of Fame. Her books have been translated into twenty-eight languages, and she has been profiled in USA Today and TIME Magazine. Her twenty-third novel, The Sum of All Kisses, was released in late 2013.